This baked macaroni and cheese casserole is easy to make with cheddar cheese and eggs along with milk and butter. There's no separate sauce to make for this version, making cleanup much easier than other versions made with a stovetop cheese sauce. Eggs and milk are whisked together and then combined with the cooked macaroni, butter, and shredded cheese. The eggs give the mixture a soft and creamy custard-like texture, and it is a real time-saver because there is no separate sauce to cook. It's a simple, homey recipe that lends itself to many possible variations. Add some crumbled cooked bacon, diced cooked sausage, or diced ham, or change the cheese. Add some Velveeta cheese to the cheddar cheese or use some Monterey Jack cheese. Pepper jack cheese can add some pleasant heat to the casserole. There are dozens of flavored cheeses to choose from; experiment with your favorites. See the recipe variations for more ideas. This easy macaroni and cheese bake takes about 30 minutes in the oven and it makes four generous servings. Grease an 8-inch or 9-inch square baking pan or 2-quart casserole. Cook the macaroni in boiling salted water following the package directions. Return the pasta to the pot and add the butter; stir until melted. Add 2 cups of the shredded cheese. Taste and add salt and pepper, as needed. Add the milk mixture to the macaroni; stir until thoroughly combined. Spoon the pasta and cheese mixture into the prepared casserole or baking pan. Sprinkle the remaining 1/2 cup cheese over the top along with paprika, if using. Bake the macaroni and cheese (uncovered) for 30 minutes, or until the cheese has melted and browned and casserole is cooked through. For a crunchy, browned breadcrumb topping, toss 1 cup of finely shredded fresh breadcrumbs with 2 tablespoons of melted butter. Sprinkle the crumbs over the macaroni and cheese and then bake as directed. Buttered panko crumbs may be used for a crispier topping. There are many kinds of pasta to choose from, including whole wheat and gluten-free. Use your favorite kind of macaroni, or make it with pasta of a similar shape and size. Macaroni and Cheese Casserole With Bacon: Crumble 4 to 6 strips of cooked bacon and add to the macaroni and cheese mixture. Spoon into the baking dish and proceed with the recipe. Macaroni and Cheese Casserole With Ham: Add 1 to 2 cups of diced cooked ham to the macaroni and cheese mixture. Spoon into the prepared baking dish and proceed with the recipe. 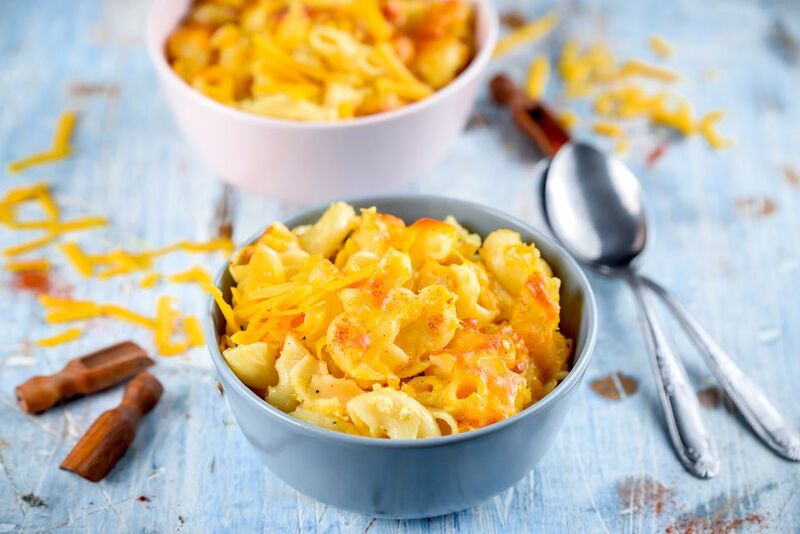 Macaroni and Cheese With Chile Peppers: Add a few tablespoons of minced jalapeno peppers or add 1 small can of mild chopped green chile peppers.